We’re very excited to introduce Liz Corkery, owner of The Print Club, who will be teaching our Basic Silkscreen Printing class at the first-ever Somerville Skillshare at the Armory on Sunday, March 2nd, 2014! Liz has studied art in London and Australia, and she recently received her MFA from Cornell University. She lives and works in Somerville. Tell us about the artistic path you took, from childhood into adulthood. Did you dream of making art from a young age? I loved drawing and painting as a child, when I was about five I coined the term “hard blocking” for my favorite, heavy-handed crayon technique. It wasn’t until relatively recently that I became committed to the path of making art my career. It was always what I wanted to do but the pragmatist in me probably always assumed I would ultimately just be bringing my creative skills to some related field rather than directly focusing on a full-time art practice. Both my parents are in the design field (landscape architects) and so when I decided to go to art school at 18 it wasn’t contentious at all. After graduating I moved to New York – perhaps an artist rite of passage and after working there for a couple of years began my MFA at Cornell which I finished this past May. I’m inspired by incredibly varied things that I usually stumble across during my endless trawling through blogs and art books. I love to travel and find myself in unfamiliar environments. I also really enjoy visiting exhibitions of contemporary artists and looking at the specific choices they make about the display of their work and the gallery space as an installation; their placement, framing or control of audience movement. 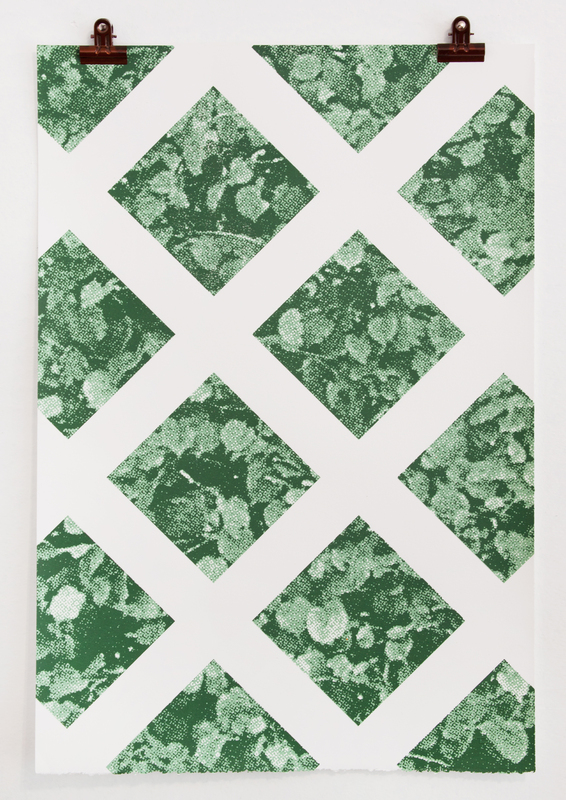 A hand-pulled screenprint in The Grid, The Trellis series. What can people expect to learn in your Skillshare class? Why did you decide to base your business in Somerville? When my partner (a printmaker too!) and I were moving to Boston we were both extremely unfamiliar with the city and its different neighborhoods. Somerville kept being mentioned by friends and colleagues as a great area for supporting the arts and was home to a lot of creative people and groups. We’ve really felt that since living and working here and the Somerville Arts Council in particular is such a uniquely committed and supportive organization, we’re excited to grow as a Somerville-based creative business. 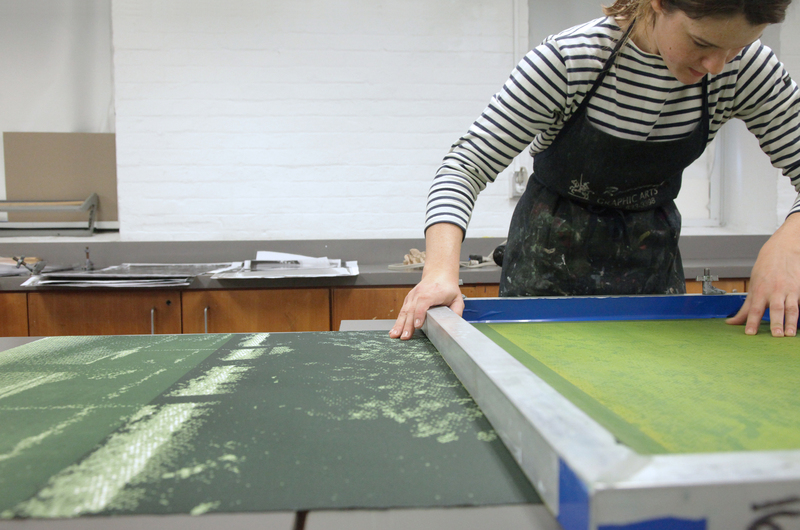 Check out Liz’s screenprinting and installation work on her website. 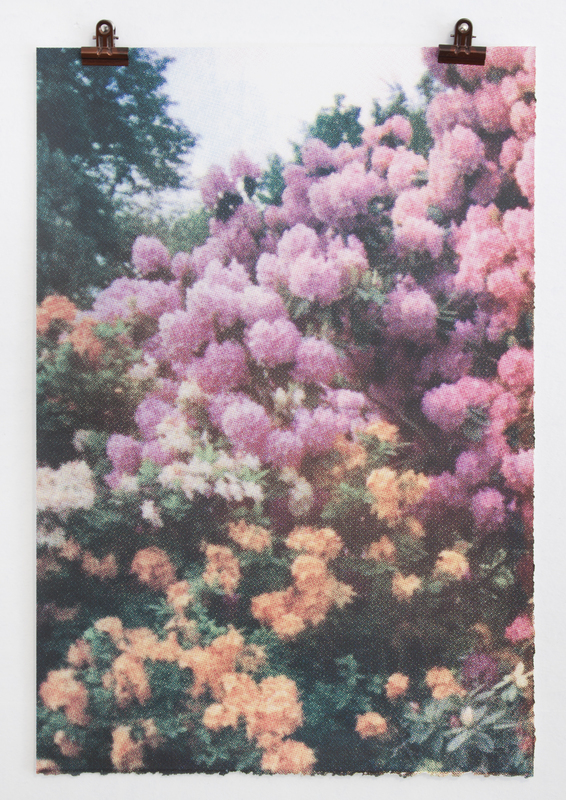 There are lovely limited-edition silkscreen prints available in the Print Club online store.